This beaded head band varies with 5 to 7 rows of multi colored and size of seed beads. It measures approximately 7/16" wide and is about 12" long but beadwork is not end to end. Crafted by Navajo artisan Sylvia Spencer (5 row) and or Deanne Martin (7 row). Colors and patterns will vary. 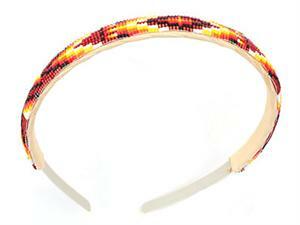 Color of headband will also vary. Currently main color of bead work is turq blue, silver, mint green or teal. Choose color when ordering or let us choose for you.